Camp is open to ages 10-18 of all ability levels. Bates College, widely regarded as one of the finest liberal arts colleges in the nation, is the perfect backdrop for summer field hockey camp. A member of the highly selective NESCAC athletic conference will offer campers a great opportunity to train with the best players and coaches in the game today. Come play on the beautiful carpet astro-turf stadium and enjoy some special experiences like yoga, film review sessions, and leadership workshops. Check In: 12pm – 1pm for both commuters and overnight campers. Tip for Extended Day Campers is to come at 12:30pm. First meal is Dinner. Check-in location will be at Hopkins and Moody House. Check Out: Sunday, August 5th. Parents are invited to attend final scrimmages that begin with warm-ups at 9:00am. Check-out and departure will follow at 12:00pm at Hopkins and Moody House. The nearest airport is Portland International Jetport in Portland, ME. You are responsible for getting yourself to and from campus, Revolution Field Hockey does not provide transportation. 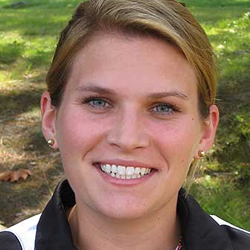 Danielle Ryder enters her 6th season as the head coach of the Bates College field hockey program in 2018 after assuming the position in June of 2013. In 2016, Ryder led Bates to its first winning season since 1999. The Bobcats finished 9-7 on the year, their most wins since that same 1999 season. 2016 also marked the first time the Bobcats have qualified for the NESCAC Championships in back-to-back years and their four NESCAC victories were the most for the program since 2002 when they won five NESCAC games. Since taking over the reins of the Bobcats’ program, Ryder has instilled a new culture of dedication in the team. In 2015, she led the Bobcats to the NESCAC Tournament for the first time since 2010. Bates also picked up its most victories in a single season since 2005. One of the Bobcats’ biggest wins in 2015 was a 1-0 victory over previously undefeated and ninth ranked Babson. In 2014, the team had two players named to the NFHCA Division III All-Region Team. In 2013, Bates registered its best goals-against average since 2006 and demonstrated marked improvement over the second half of the season. Prior to Bates, Ryder served as head coach at the University of New England for two years, compiling a 29-14 record, two postseason appearances and guiding the Nor’easters to the first Division III national ranking in program history. Before her stint at UNE, Ryder was an assistant coach at the University of Vermont, and at Bates’ NESCAC rival Tufts University before that. Ryder was named the 2011 Commonwealth Coast Conference Coach of the Year, after leading the Nor’easters to a program-record 18 wins against four losses. UNE began the year with 13 straight victories and appeared in the National Field Hockey Coaches Association Division III poll for two weeks, including a No. 2 ranking in New England. The season came to a close with two overtime setbacks in the conference final (2-1 to Endicott) and an ECAC Championship semifinal (2-1 in 2OT to Mount Holyoke). In 2012 she led the Nor’easters to the semifinals of both the CCC and ECAC tournament semifinals. A native of Sturbridge, Mass., Ryder graduated from Stonehill College in 2008 with a bachelor’s degree in psychology. She played goalkeeper for the Division II Skyhawks, finishing her career as the team’s all-time leader in shutouts and earning Northeast-10 all-conference and all-academic honors.